A Thursday afternoon visit to this Fullers pub. Appears in the current GBG and also the 2017 version, I assume for its ale and interior which is cracking. Surprisingly busy for a pub that doesn't strike me as being a locals pub. The clientele were mainly all office / city types. 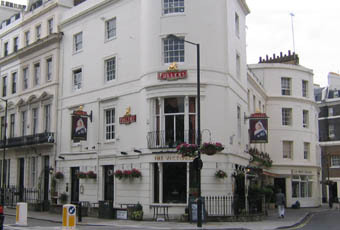 The area around the pub is made up of hotels, hostels and large expensive apartments and flats. The walls are covered with framed pictures of Queen Victoria, the wallpaper is best described as opulent, there's a serious of wood panelling, ornate gilded mirrors, a wooden and tiled fireplace and some attractive lamps and chandeliers. Seating is arranged around the outside with a quantity of stools at the bar. In addition to the main bar area there is also a theatre bar and library.....I didn't check these out. On the 5 hand pumps were 4 Fullers ales and Gipsy Hills Beatnik. I opted for Chiswick Bitter, a nice well kept pint and at £3.60 a pint it was very reasonable in this part of town. Has apparently been a pub for over 170 years. Not an area I've ever really drank in, just a passing stop from time to time so no wonder I've missed this gem. Its well worth the visit and it's inclusion in the GBG. Superb traditional boozer with well kept ales. Haven't been in for some time but I shall have to take the time to quaff a few lovely Fullers beers here on my next visit to the smoke. If I lived nearby it would be very hard for me to leave this place once I had entered the doors and sat down to sup some splendid samples of Fullers excellent offerings. Great visit yesterday. Top notch beers, attentive staff and food looked good too although we didn't eat there. Food was a bit pricey but I guess in keeping with other pubs in the area. Surprisingly the beer wasn't too expensive, comparatively, at £15.20 for 4 pints. Nice Victorian pub that I'll probably go back to soon. Great character Victorian pub in relaxed Bayswater. 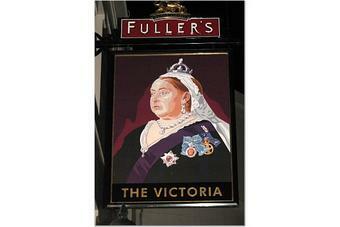 Reliable Fullers range of ales and good food. Service efficient and friendly. Would definitely return.